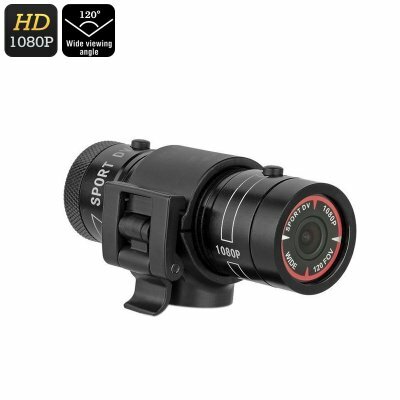 Successfully Added Kingear KG006 Mini Sports Camera - Solid Metal Body, Waterproof, 1080p Video, 1.3MP CMOS, 120-Degree Lens, TF Card Support to your Shopping Cart. Record all your upcoming extreme adventures in stunning 1080p resolution with the Kingear KG006 Mini Sports Camera. This sports action camera features a solid metal shell that makes it extremely durable. It is furthermore resistant to water thanks to which you’ll be able to use it in any environment or weather condition. Thanks to its durable and tough design, you won’t have to worry about accidentally breaking this camera while out in the wild. This makes your gizmo perfect for recording extreme sports such as motor crossing, mountain climbing, or skiing. With its 1.3MP CMO sensor, this sports action camera produces crisp Full-HD video at 1080p resolutions. It furthermore comes with a 120-degree lens that lets you capture stunning wide-angle footage. With this action camera attached to your gear, you can be assured that not a single detail of your activities stays uncaptured. The camera itself is small in size and light in weight, allowing you to easily carry it along anywhere you go. Packed within its metal body, you’ll find a 680mAh battery. This cell treats you to hours’ worth of continuous usage time for you to enjoy throughout the day. The camera supports a micro SD card slot, meaning that it will instantly store all your recorded video and photo’s that can be watched back later on your PC or laptop. If you’re looking for an extremely durable helmet cam that follows you on all your upcoming adventures, the Kingear KG006 Mini Sports Camera is the ultimate gizmo for you. The Kingear KG006 Mini Sports Camera comes with a 12 months warranty, brought to you by the leader in electronic devices as well as wholesale action cameras..